The background: It was a long time ago; I don’t think I was 20 yet. It was a check I had written to my therapist. (Yes, I started researching relationships at a young age.) As soon as I realized what had happened/was about to happen, I called the office manager to own up to it. I confessed that I had simply screwed up in terms of managing my balance. My motives: I wish I could tell you that I called so promptly, and spoke so candidly, because I was wise beyond my years in the ways of trust. Truth be told, I was just as caught up in the very human shame and discomfort of it. It simply seemed far less embarrassing to go on the offense and initiate a conversation about it. Underestimating the value of truth-telling. Forthrightness and willingness to face facts are quickly perceived by others as character virtues. This nearly always immediately outweighs the uncomfortable content at hand. Over-estimating the probability (and cost) of disapproval. Generally speaking, the truth is liberating for everyone involved. The recipients of uncomfortable news—like my therapist’s office manager—usually see it simply as something to be dealt with and then move on. We’re the ones who get hung up on what we perceive to be their emotional baggage. 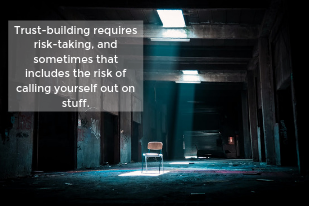 Trust-building requires risk-taking, and sometimes that includes the risk of calling yourself out on stuff. No matter your bank account balance. This week, take stock of recent times that you’ve hesitated to call attention to your own goofs or liabilities. Imagine a do-over: what would it look or sound like? 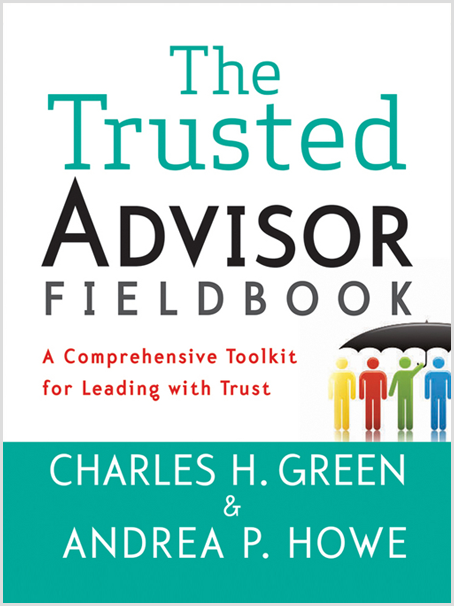 Read about five common ways we lie to clients (the first article Charlie Green and I ever co-authored), or brush up on how caveats can help you say the tough stuff in Chapter 9 of The Trusted Advisor Fieldbook.